Majority of the Indians might have tasted this chatpata chaat and a favorite among many too,I too love chats and I rank this after golgappa & panipuri.Who can resist this instant spicy,tangy flavors with crunchy bites..hmm,love it!! Bhelpuri as famously is a puffed rice with vegetables and a tangy tamarind sauce served as chaat.It is commonly prepared instantly and consumed as soon as possible or else the sev becomes soggy and spongy.The sev is garnished with tomatoes,onion,coriander leaves,lime juice and in the northern parts in India,they add boiled cut potatoes too.This is usually served with the dark brownish color sweet tamarind chutney with dates and the green spicy chutney prepared using mint,coriander and green chillies.So,Enjoy this recipe at home with your loved ones!!! I have a separate post on chutneys here,check it out. 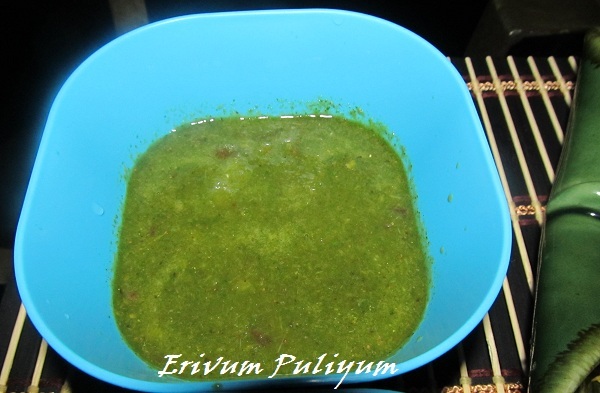 -Wash and clean the leaves.Chop the other ingredients.Grind it to a smooth paste with chat masala and salt. -Deseed the dates and soak in a little water for 2 hours or microwave 3-4 mins to make it soft. -Soak the tamarind in water for 15-20 mins and squeeze out the pulp.Keep aside. -Soak the jaggery in a small amount of water and remove impurities if any. -Serve it with bhelpuri and refrigerate the remaining in air tight containers. 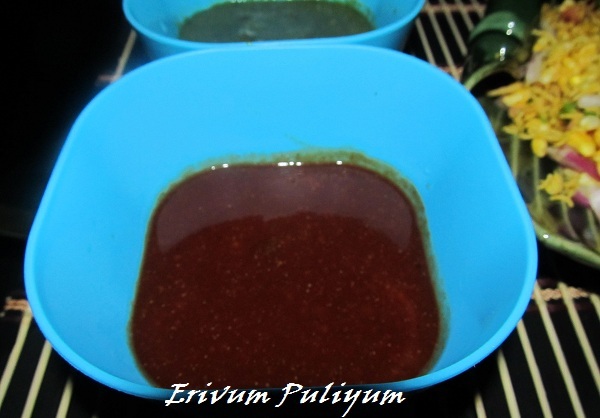 -Take a large bowl ,mix all the above ingredients,except the chutneys,lime juice.Mix the spice powders. 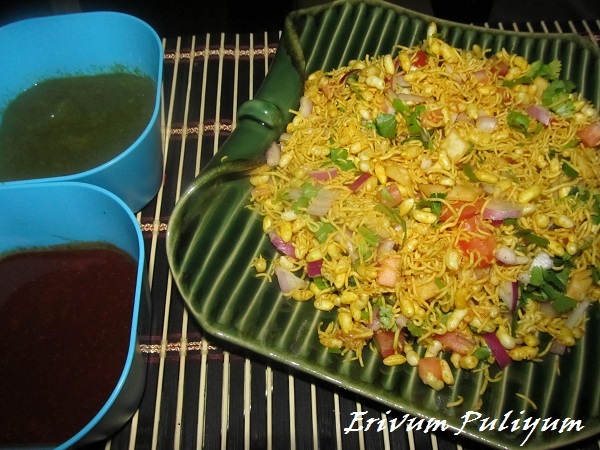 -Mix the chutneys and lime juice just before serving otherwise the sev will become soft. * You can add one boiled cubed potato , few pomegranate seeds/peanuts to make it more crunchy. * You can store both the chutneys in refrigerator for 15 days in air tight containers for future use. Wow,I badly need this right now..What a missing.Send me those Julie. 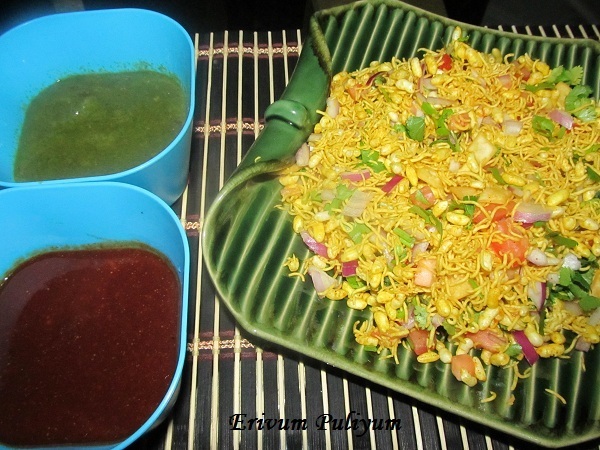 wonderful bhel with yumm looking chutneys..
All time favorites, looks super yummy. 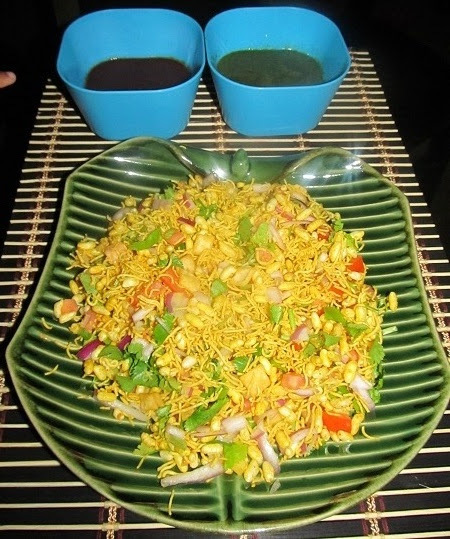 I like meetha bhel. I love my bhel soaking wet with chutneys and sloppier it gets tastier it is..
Before leaving home I quickly check 1or 2 blogs. here I find a salivating chaat with spicy chutney. have a good day! Love bhel puri & yours looks great! Wow!,Super-yumm n flavorful Street-snack item Dear.Fabulous. Nice julie :) we have something in common 2day! 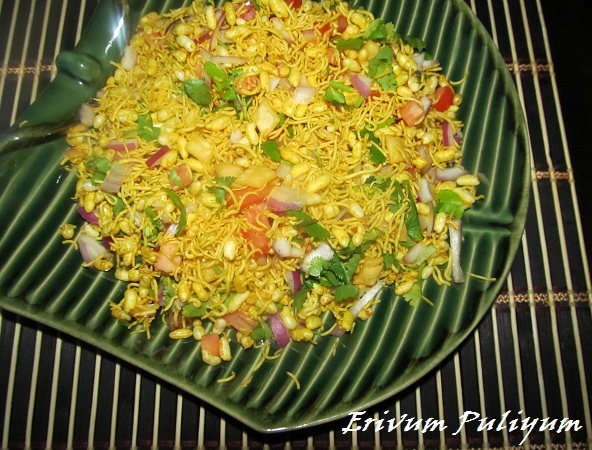 even i have posted bhel :)... celebrating chats today ! Can I have a plate, Julie, looks very inviting..
i love chaat items a lot, your platter tempting me more...nice preparation...loved it!! wow..chat looks awesome..tempting pics..mouthwatering here! yummy!feel like digging right in! 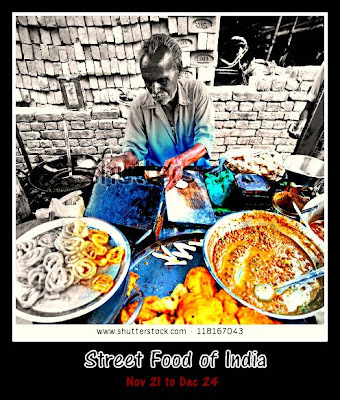 very delicious chaat, looks yum..chutneys too look good..
Julie, the chaat looks wholesome and delicious. Loved it. Absolutely divine..! yummy chaat with vibrant colors. Chats are my favourite!! This looks yum with the chutneys!! mmmm.... mouth watering pics. One of my favorite chaat..